The Digital Age was expected to usher in an era of clean production, an alternative to smokestack industries and their pollutants. But as environmental journalist Elizabeth Grossman reveals in this penetrating analysis of high tech manufacture and disposal, digital may be sleek, but it's anything but clean. Deep within every electronic device lie toxic materials that make up the bits and bytes, a complex thicket of lead, mercury, cadmium, plastics, and a host of other often harmful ingredients. High Tech Trash is a wake-up call to the importance of the e-waste issue and the health hazards involved. Americans alone own more than two billion pieces of high tech electronics and discard five to seven million tons each year. As a result, electronic waste already makes up more than two-thirds of the heavy metals and 40 percent of the lead found in our landfills. But the problem goes far beyond American shores, most tragically to the cities in China and India where shiploads of discarded electronics arrive daily. There, they are "recycled"-picked apart by hand, exposing thousands of workers and community residents to toxics. As Grossman notes, "This is a story in which we all play a part, whether we know it or not. If you sit at a desk in an office, talk to friends on your cell phone, watch television, listen to music on headphones, are a child in Guangdong, or a native of the Arctic, you are part of this story." The answers lie in changing how we design, manufacture, and dispose of high tech electronics. Europe has led the way in regulating materials used in electronic devices and in e-waste recycling. But in the United States many have yet to recognize the persistent human health and environmental effects of the toxics in high tech devices. If Silent Spring brought national attention to the dangers of DDT and other pesticides, High Tech Trash could do the same for a new generation of technology's products. "We depend on writers like... Elizabeth Grossman—writers working in the great tradition of bold and rigorous American thinkers, observers, critics and muckrakers from Henry David Thoreau to Upton Sinclair, Aldo Leopold, Rachel Carson and Bill McKibben—to shake us awake, dispel the fever dream of consumerism and reveal the true cost of our love for technology and our obsession with machines and disposable goods." "…as environmental journalist Grossman reveals in this engaging book, these everyday symbols of the 21st century rely on toxic materials (e.g., lead, mercury, chlorine, flame retardants) born of complex mining operations and chemical reactions, both of which can degrade the environment and affect human health…. 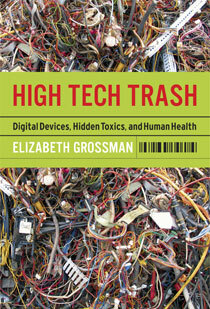 Her language is quiet, clear, and compelling…Strongly recommended for all collections…"
"Grossman manages to create a coherent, informative and scary narrative out of the births and deaths of electronics from TVs and cell phones to computer monitors and iPods." "Grossman takes readers on an eyeopening, even shocking tour of the cyber underground, clearly and methodically explicating the science, politics, and crimes involved in the mishandling of the ever-increasing tonnage of e-waste." "In this astonishingly wide-ranging investigation, Elizabeth Grossman exposes the toxic fallout from manufacturing and discarding high-tech gadgetry." Elizabeth Royte, author of "Garbage Land: On the Secret Trail of Trash"
"Lizzie Grossman is among our most intrepid environmental sleuths—here she uncovers the answer to one of the more toxic questions of our time." "[High Tech Trash] will change the way you shop, the way you invest your money, maybe change the way you vote. It will certainly change the way you think about the high tech products in your life." Kathleen Dean Moore, author of "The Pine Island Paradox"
"From Arctic ice caps to dumps in southern China, Grossman takes readers on an amazing world tour as she reveals the hidden costs of our digital age. This is a story for our times." Sandra Steingraber, author of "Living Downstream: An Ecologist Looks at Cancer and the Environment"